Sanford Meisner on Acting (Paperback) | The Drama Book Shop, Inc.
Sanford Meisner was one of the best known and beloved teachers of acting in the country. This book follows one of his acting classes for fifteen months, beginning with the most rudimentary exercises and ending with affecting and polished scenes from contemporary American plays. Written in collaboration with Dennis Longwell, it is essential reading for beginning and professional actors alike. Throughout these pages Meisner is a delight—always empathizing with his students and urging them onward, provoking emotion, laughter, and growing technical mastery from his charges. With an introduction by Sydney Pollack, director of Out of Africa and Tootsie, who worked with Meisner for five years. As head of the acting department of The Neighborhood Playhouse for forty years, Sanford Meisner was considered one of the greatest acting teachers of our time. 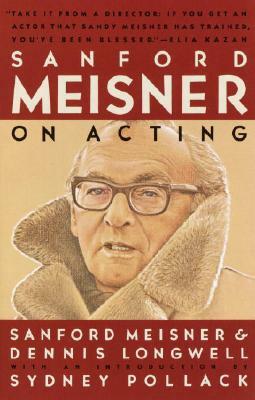 As a founding member of The Group Theatre, Mr. Meisner also acted in many of its stage productions, including Awake and Sing!, Paradise Lost, An American Tragedy, Golden Boy, and Crime and Punishment. Some of the thousands of actors he taught in his classes at The Playhouse include, among others, Elizabeth Ashley, Barbara Baxley, James Broderick, James Caan, Keir Dullea, Robert Duvall, Lee Grant, Lorne Green, Tammy Grimes, Anne Jackson, Diane Keaton, Louise Lasser, Darren McGavin, Steve McQueen, Gregory Peck, Suzanne Pleshette, Tony Randall, Jo Van Fleet, Jon Voight, Eli Wallach, and Joanne Woodward. Mr. Meisner died in 1997. After earning a degree in philosophy from Yale, Dennis Longwell studied acting with Sanford Meisner in the 1960s. He has also worked as an actor, teacher, and museum curator. His monograph, Steichen: The Master Prints, 1895–1914, published by the Museum of Modern Art in 1978, is the definitive book on the early photographs of Edward Steichen. Mr. Longwell is currently a visiting Associate Professory of History of Art and Design at the Pratt Institute.